What Are the Benefits of Squid Ink? You might be familiar with calamari, deep fried rings of squid served with a side sauce or a lemon wedge, but squid ink is likely less familiar, even though it comes from the same source. Squid produce ink as a defense mechanism. You can harvest this ink on your own, and it is also readily available in specialty grocery stores and seafood markets. You can add squid ink to foods to create a rich flavor and deep, black color. It's rich in iron and antioxidants and provides a number of potential health benefits. A 2013 issue of "International Aquatic Research" found that squid ink contained numerous antioxidants, which were present even after the melanin, the compound that produces the black color, was removed. In an in vitro study, scientists found that the antioxidants present in squid ink had strong preventive lipid oxidation abilities -- a benefit that might link them to lower risk of heart disease in humans. However, human studies as well as long-term research are still needed, so it's premature to think of squid ink as a heart disease treatment. In a 2008 issue of the "Journal of Food Science," researchers found that squid ink helped reduce iron deficiency anemia in rats. Rats on a low-iron diet that were fed a supplement of squid ink showed higher red blood cell and hemoglobin counts than rats who did not receive the supplement. While further research is still needed, researchers theorize that squid ink may be able to function as a new source of dietary iron for humans. Iron is an essential mineral as it is needed to produce hemoglobin and myoglobin, two proteins found in red blood cells that help carry oxygen throughout your body. Squid ink is naturally high in glutamic acid, sometimes accidentally called glutamates, which produces the deep, rich flavor associated with umami. Like other rich-tasting foods, such as truffles and Parmesan cheese, squid ink adds instant flavor because of the glutamic acid content, even though it is not a salt or fat, two of the more common flavor-boosting ingredients. Using squid ink means you can reduce the amount of salt you add to a dish to increase flavor, according to Marcella Hazan, author of the "Essential of Classic Italian Cooking." A diet high in sodium -- which many Americans already follow -- increases your risk of heart disease and high blood pressure. However, squid ink's glutamic acid content means it can cause side effects in some people -- avoid squid ink if you're sensitive to other sources of glutamates, like MSG. Common in Italian and Spanish cuisine, squid ink is also now being used more frequently in Southeast Asian cooking. 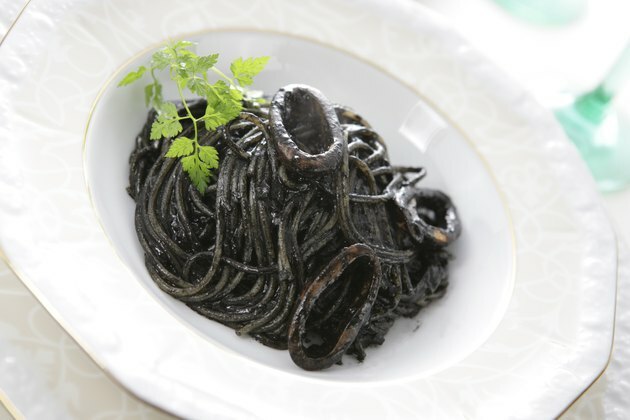 Squid ink can be added as a sauce to dishes, such as risottos, where it adds an inky black sheen to foods and a deep flavor. Other preparations include adding the ink into the starch, such as with squid ink pasta, making for a dark black pasta that shows off the bright colors of vegetables very well.